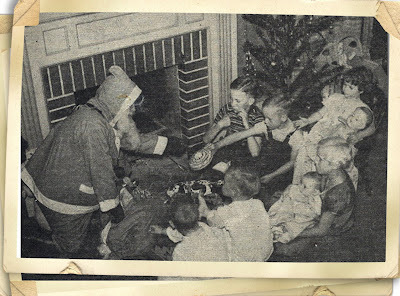 Grandma Bennett was known as Mrs. Santa. I like to think that our family’s love of Christmas was inherited from our Grandmother Bennett. She was a compassionate woman who worked along side a doctor as a midwife. She loved serving others especially her family. The following is an excerpt from a 1940 article that appeared in the Relief Society Magazine which was an official church publication at that time. Yes, there really is a lady Santa Claus. No she does not live at the North Pole, but in her modest little home near the Wasatch Mountains. 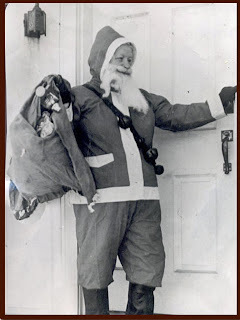 This short chubby Mrs. Santa is wholly convincing dressed in her bright red suit with its white trimmings, and with the saucy little hood coming down to the upper tips of the white beard, and black shining boots that afford her ample protection for wading through the snow and ice as she shoulders her bag and starts out on her round of home calls each Christmas Eve. Tucked away in the bag are penny all-day suckers transformed into dolls with crepe paper dresses, penny balloons, tempting red apples with marshmallow faces, and many other inexpensive gifts to gladden the hearts of tiny tots. The jingle of the old-fashioned sleigh bells, which hang from her shoulder, announces her approach--yet there is no sleigh (or automobile) at her command. She walks. 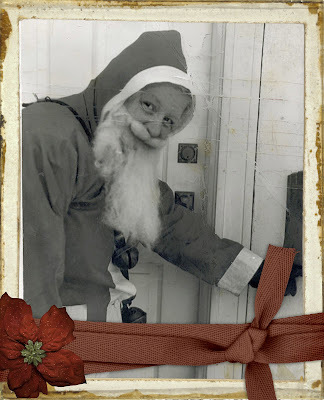 Her visits take her to different parts of the city, and chiefly into the homes where she feels that “Santa” could give the most cheer--where there is an ill or a crippled child, a lonely woman, an elderly couple who might be “remembering” on Christmas Eve, or where sorrowing folk might be cheered by a comforting word. Then, too, Mrs. Santa has become a tradition in many families, and it would not be Christmas Eve without her brief visits. To her neighbors and friends, she is Mrs. Mary Bennett, a good neighbor, a true friend, and her husband’s loyal helpmate. For many years, Mrs. Bennett had dreamed of the day when she could know the joy of making others happy at Christmas. But the years rolled by, each one much the same as the last. Then, ten years ago, she decided that if she ever expected to do anything about it, now was the time to begin. Little by little, her hopes evolved into a plan--not an elaborate plan, such as she would like, but at least one that would enable her to bring smiles of happiness to the faces of small children. Although it was only a few days before the New Year, and there was yet ample time before the next Christmas, she decided to act upon her plans at once, lest she change her mind. Hurrying to town, she purchased the cloth for her Santa Claus suit. As she cut, stitched, and fitted, other plans came into being. With the suit completed, she turned her attention to the bag and its contents. She resolved that each day or each week, she would make some little gift to place in the bag. Out of the sewing box came bits of left-over materials which her deft fingers fashioned into adorable little front aprons for the wee lassies and comfy bibs for the babies. From small scraps of flowered lawn (pima cotton), white voile, and two-cents-a-yard lace, she created dainty hankies to delight many a small miss. Often the few extra pennies in her purse were spent for tiny, bright trinkets--a china doll, or quacking ducks and croaking frogs that sing the same tune when squeezed between the thumbs and fingers of little chaps who adore noise makers. A few old-fashioned net stockings were filled with candy, nuts, a few small picture books, and topped with an orange--these for the homes where children might be disappointed on Christmas morning. Then when those last busy days before Christmas came again, they found her ready and waiting with only the popcorn balls to make, wrap, and pack into her bag. I have read this article many times over the years. I do not have too many memories of my Grandmother Bennett except for stories and photos given to me by others. This is my favorite. 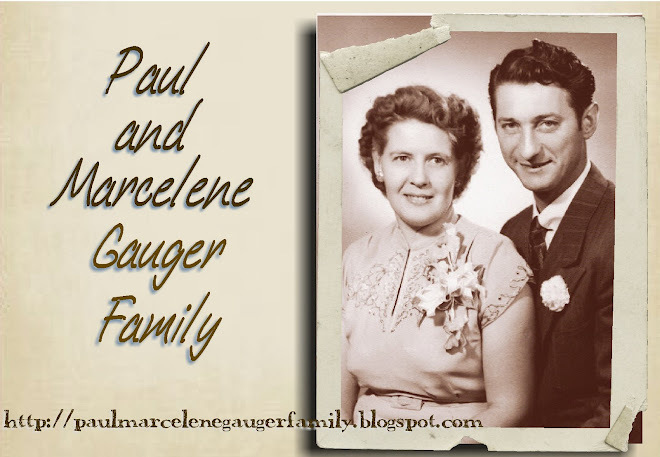 Posted by Paulene Gauger Davis, daughter of Paul and Marcelene Gauger, sister to Dennis Gauger, and granddaughter of Mary Bennett.